The very first challenge for colonists was moving things (and themselves) around the local area. In the very early days, with only a settlement at Sydney Cove and few animals that could be ridden or used to pull vehicles, transport was by foot or by boat. One of the first needs for Sydney was barracks, and bricks and tiles had to be made for these, and timber had to be cut. Then all of these heavy items needed to be transported. When the First Fleet arrived in Australia, it was very poorly equipped. One problem they faced was the quality of the tools sent out by the government. Back then, cheap tools were made for bartering in the “African trade”, and that was the quality of tool sent to Australia. Governor Phillip was savage when he made this point in a despatch to Evan Nepean’ the Home Secretary, written on 28 September 1788 after eight months’ experience of the shoddy tools. The tools and articles in the inclosed lists will be much wanted by the time they can be sent out, and I cannot help repeating that most of the tools were as bad as ever were sent out for barter on the coast of Guinea. — Historical Records of Australia, 1(1) 86. The First Fleet had sailed in 1787 with enough food for two years, if everything went well, and things might have gone well. They had seeds of many crops, and they also had a good supply of animals, but these were mainly brought for breeding, and many others were, in any case, animals to eat. Any making and building meant things had to be moved, but where were the horses and bullocks to do the hauling? With just seven horses and seven cattle in the colony, the hauling would at first have to be done by humans, and the mills would need to be turned by wind power or water power. To convey these materials from the brickfield to the barrack-ground, a distance of about three-quarters of a mile, three brick-carts were employed, each drawn by twelve men, under the direction of one overseer. Seven hundred tiles, or three hundred and fifty bricks, were brought by each cart, and every cart in the day brought either five loads of bricks, or four of tiles. To bring in the timber necessary for these and other buildings, four timber-carriages were employed, each being drawn by twenty-four men. — David Collins, An Account of the English Colony in New South Wales, volume 1, 331. For this offence he was severely punished, and removed from the hut in which he had been placed; yet as, notwithstanding his villainy, he was too useful a person to part with and send to a brick cart, he was still retained to fish for the settlement; but a very vigilant eye was kept over him, and such steps taken as appeared likely to prevent him from repeating his offence, if the sense of shame and fear of punishment were not of themselves sufficient to deter him. — David Collins, An Account of the English Colony in New South Wales, volume 1, 1798, 44 – 5. 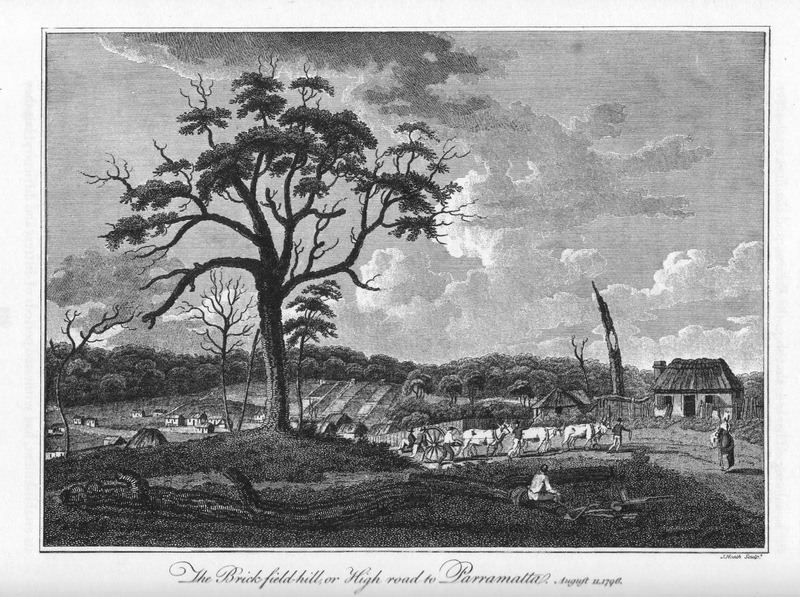 … the lieutenant-governor directed that the convicts employed in cultivation, those employed under the master bricklayer, and those who worked at the brick carts and timber carriages, should labour from seven in the morning until ten, rest from that time until three in the afternoon, and continue at their work till sunset. — David Collins, An Account of the English Colony in New South Wales, volume 1, 1798, 239. Wilkinson’s grinding machine was set in motion this month. It was a walking mill, upon a larger construction than that at Parramatta. The diameter of the wheel in which the men walked was twenty-two feet, and it required six people to work it. Those who had been in both mills (this and Buffin’s, which was worked by capstan-bars and nine men) gave the preference to the latter; and in a few days it was found to merit it; for, from the variety and number of the wheels in Wilkinson’s machinery, something was constantly wrong about it. Finding, after a fair trial, that it was imperfect, it was taken to pieces; and Buffin was employed to replace it by another mill upon the same principle as that which he had himself constructed; and Wilkinson returned to Parramatta. — David Collins, An Account of the English Colony in New South Wales, volume 1, 1798, 305. In time, though, bullocks became a major source of power, and I may get around to them, one day. from David Collins, An Account of the English Colony in New South Wales. A tread-mill, the first of the kind in the Colony, we are informed, has been set going this week m the Carters’ Barracks. There can be no doubt but that this instrument will prove as salutary in this Country, in the repression of crime, as it has been found efficacious in the Mother Country. It is fit that men should smart for the abuse of that Royal mercy, which is so repeatedly despised. When Macquarie Harbour fails in deterring obdurate offenders from the commission of vice, then it is high time that the place of execution should sweep them away from the face of that earth, which groans under the weight of the many years’ atrocity that supplicates Heaven’s justice! The whole line of road to the diggings presented an animated appearance: drays, carts, cars, equestrians, pedestrians, and last, though not least to catch the eye, was an old man wheeling his all up in a barrow, his son harnessed in front, and his wife bringing up the rear, with a child on her back, who generally got a cheer from passers-by, or a question, as to how much she’d take for her “swag.” At every public house or coffee-shop on the road, all sorts of people were to be seen, and, excepting Esquimaux or Patagonians, every nation on earth might here be found represented. — C. Rudstone Read, What I Heard, Saw, and Did at the Australian Gold Fields, 1853, 5 – 7. Read added as a footnote that this party returned to Sydney at Christmas with £1000. Then there were those who used human power to drive bicycles, which I dealt with recently. Sorry, that’s not quite right. I write and sometimes broadcast about science, for young and old. Use the link below to view my complete profile then look for the link on the left for my web site. I write mainly about science, or consumer history for both adults and children, depending on how the fit takes me on a given morning. I usually have one book coming back after editing or in production, one being edited, one being written and one or more being actively researched.